A Celebration of the Life of the Late NHRA Funny Car Driver, Tripp Shumake. Tripp Shumake loved anything with an engine. From fixing up hot rods in high school in Glendale, Arizona, to becoming an NHRA champion Funny Car driver, Shumake was born to drive. He was well respected in the racing community for his abilities not only as a driver but also for being the humble, funny, family man he was. 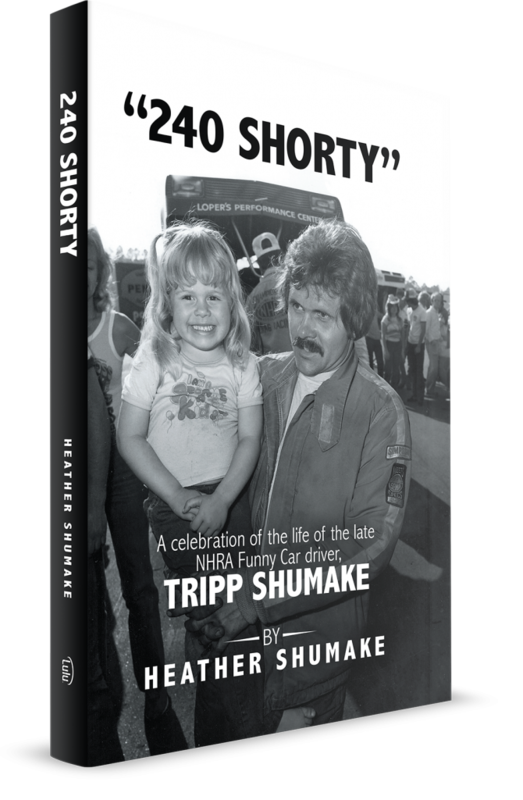 Off the track, Shumake was a Christian and deeply involved in his church community.Tragically, on November 13, 1999, Tripp was killed in a hit-and-run accident on his motorcycle. Taken too soon, his friends, family, and fellow racers share their memories and celebrate the life of Tripp in 240 Shorty. Copyright © 2015. Heather Shumake. All rights reserved.